The cell. 5. Vesicular trafficking. Endosome. Atlas of plant and animal histology. Endosomes are membrane-bound compartments showing irregular shapes, like large bags, although sometimes they form tubular structures. Like the TGN of the Golgi apparatus, endosomes are stations for receiving and shipping molecules packed in vesicles. Vesicles arrive to endosomes from plasma membrane and TGN of the Golgi apparatus. 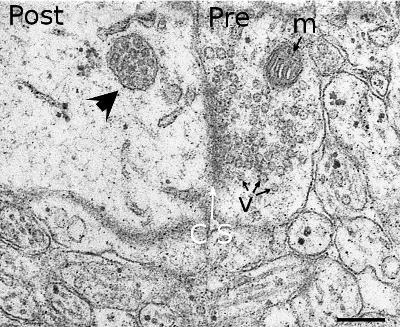 Intracellular compartments formed after phagocytosis and macropinocytosis become particular types of endosomes known as phagosome and macropinosome, respectively. Most molecules of the endosomes are transported to lysosomes for degradation. However, there are also vesicles leaving toward the plasma membrane or TGN of the Golgi apparatus, both are recycling pathways for membrane receptors and lipids. a) Several types of endosomes. There are stable endosomes in the same cell with different features and performing different functions. Early endosomes are close to the plasma membrane and receive endocytosis vesicles. 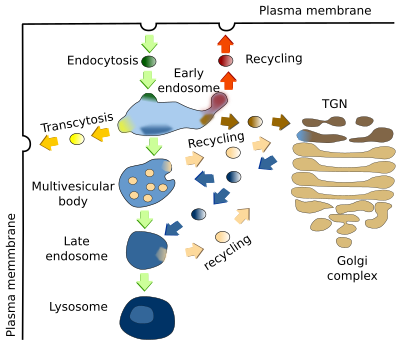 Recycling endosomes are located a bit deeper in the cell and deliver vesicles to the plasma membrane and Golgi apparatus. Multivesicular bodies and late endosomes are found in a deeper part of the cytoplasm, get vesicles containing acid hydrolases from Golgi apparatus, and send vesicles for recycling to the Golgi apparatus. Late endosomes eventually fuse with lysosomes for the degradation of their content. All these types of endosomes are communicated between each other by vesicles. b) Endosomal maturationspan>. A second hypothesis suggests that endocytic vesicles fuse between each other to form an early endosome close to the plasma membrane. Early endosomes move to the inner cytoplasm and, during the travel, there is a maturation process that transforms early endosome in recycling endosome. Endosomal maturation is produced by new material coming in vesicles from the Golgi apparatus and, at the same time, releasing endosomal material packaged in vesicles sent to the plasma membrane and Golgi apparatus. Recycling endosomes are progressively transformed in multivesicular bodies and late endosomes, and finally they become lysosomes by progressive internal acidification, or by fusing with nearby lysosomes. In this way, all endosomes described so far are actually different stages of a continuous maturation process. It is not clear yet which of these two proposals (stable or maturation endosomes) are correct or if both of them are working at the same time. However, there are evidences supporting more strongly the maturation mechanism. Different endosomal types are distributed in particular cytoplasm regions (Figure 1). Early endosomes are found near the plasma membrane, the cytoplasm periphery. As they mature, they move to inner cytoplasm as recycling endosomes, and are finally concentrated at a perinuclear region as multivesicular bodies and late endosomes. The set of perinuclear endosomes is known as endosomal claw. In this way, the function of endosomes are also spatially segregated: the material is acquired in the cell periphery, recycled during the journey, and degraded in deeper places of the cytoplasm. Proteins like Arf, Rab and Arf-lik (Arl) are involved in establishing the position and movement of the endosomes. It is of notice that late endosomes keep perinuclear position by interacting with the endoplasmic reticulum. Actually, endoplasmic reticulum may be also involved in fission and fusion of endosomes, similarly as it does with mitochondria. Figure 1. Different types of endosomes are usually located in different cytoplasmic regions. 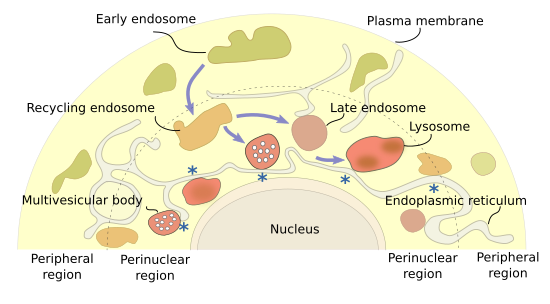 Early endosomes are found in the periphery, recycling endosomes move from periphery to inner regions, and multivesicular bodies / late endosomes are concentrated in perinuclear regions, intermingled with lysosomes. Asterisks indicate possible contact sites between endosome membranes and endoplasmic reticulum membranes. Early endosomes are the target of endocytic vesicles (Figure 2). They become recycling endosomes when are capable of sending vesicles back to the plasma membrane. The recycling flux can be very intense and returns to the plasma membrane up to 90 % of the proteins and 60 % of the lipids which have been previously endocytosed. It is not easy to distinguish between an early and a recycling endosome. Early/recycling endosomes have an acid pH (around 6.5) compared with the cytosolic pH (around 7.2). This difference is due to ATP-dependent proton pumps located in the endosomal membrane. The slightly acid pH inside the endosomes allows the release of ligands from their receptors (that were located in the plasma membrane). In this way, receptors may be sent back to the plasma membrane by recycling vesicles, whereas ligands can follow the degradation pathway toward lysosomes. The vesicles arrive or leave endosomes at different spatial domains of the endosomal membrane. Actually, it has been suggested that there are several spatial domains in the endosomal membranes: those receiving endocytic vesicles, for the departure of recycling vesicles, for vesicles targeted to the Golgi apparatus, and some authors suggest that there are other less known domains. Figure 2. Types of endosomes, and main traffic pathways they are involved in. Multivesicular bodies, and late endosomes (Figure 2), are the previous step for degrading endocytosed molecules, which finally occurs in lysosomes by acid hydrolases activity. Molecules for degradation are included in the early endosomes, and acid hydrolases are packaged in vesicles in the TGN of the Golgi apparatus that get fuse with multivesiclular bodies / late endosomes. Proton pumps located in the membranes of multivesicular bodies / late endosomes progressively decrease the inner pH and make a suitable ambient for acid hydrolases activity. The optimal activity, at pH 5, is reached in lysosomes. Recycling vesicles carrying receptors and membrane are released from multivesicular bodies / late endosomes back toward the TGN of the Golgi apparatus. Multivesicular bodies were first described according to their morphological features (Figure 3). They are rounded organelles with a membrane enclosing a variable number of inner vesicles (from two to dozens). Typically, multivesicular bodies are 250 to 1000 nm in diameter. They can occasionally show some tubular structures, and are moved through the cytoplasm by means of microtubules. The inner vesicles (30 to 60 nm in diameter) are formed after small invaginations of the multivesicular body membrane. In this way, it is possible to degrade molecules membrane lipids, transmembrane proteins, and also small cytosolic portions which are incorporated inside each vesicle. The multivesicular body content may be degraded in lysosomes or released to the extracellular space by fusion with the plasma membrane. The fusion of multivesicular bodies with the plasma membrane allows the release of the inner vesicles, which are renamed as exosomes. There is still another possibility in the synapses of the nerve tissue, where vesicles from multivesicular bodies may fuse with the plasma membrane. This mechanism is referred as back-fusion, and multivesicular bodies may work as a transient storage for certain molecules. It may explain why this organelle is frequently observed in synaptic terminals. Maturation of multivesicular bodies leads to late endosomes. Figure 3. Multivesicular body (arrowhead) in the dendrite of a motoneuron of the hypoglossal nerve. The multivesicular body contains many inner vesicles and is near a synaptic contact. Scale bar: 250 nm. The tissue has been processed as described in Rind et al., 2005. Post: postsynaptic dendrite; Pre: presynaptic terminal; m: mitochondria; v: vesicles: CS: synaptic contact. (Image kindly provided by Chris von Bartheld. Department of Physiology and Cell Biology, University of Nevada School of Medicine. USA). Acid hydrolases are synthesized and included in vesicles in the endoplasmic reticulum. After being transiently part of the cis domain of the Golgi apparatus, these enzymes are then moved to the TGN. In the Golgi apparatus, a phosphate group is added to one mannose of the hydrolases. Acid hydrolases are then segregated from other TGN molecules by a transmembrane receptor that recognizes their mannose-6-phosphate moiety. Receptor-hydrolase complexes are then gathered in membrane areas enriched in clathrin, where vesicles enclosing the receptor-hydrolase complexes are formed. These vesicles are targeted to multivesicular bodies/late endosomes, and fused with them. The acidic pH inside these organelles, compared with that of the TGN, makes possible the release of hydrolases from their receptors. The phosphate group of the hydrolases is removed and the receptors are packaged again in vesicles going back to the Golgi apparatus. Meanwhile, hydrolases continue their way toward lysosomes. Figure 4. The journey of the acid hydrolases. Acid hydrolases are synthesized in the rough endoplasmic reticulum (1), enclosed in vesicles, and moved to the Golgi apparatus (1). In this organelle, a phosphate group is added to one of their mannoses (2). 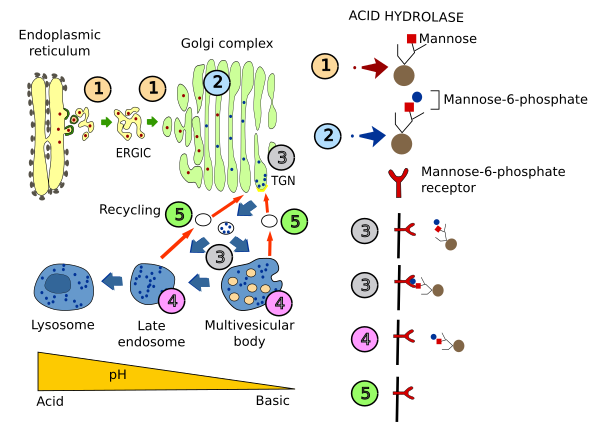 In the TGN of the Golgi apparatus, mannose-6-phosphate-hydrolases are recognized by membrane receptors (3). The receptor-mannose-6-phosphate-hydrolase complexes are gathered and included in vesicles (3) targeted to the multivesicular bodies/late endosomes, and fuse with them. In these endosomes, the pH is more acid than in the TGN so that acid hydrolases are released from their receptors (4). The receptors are then enclosed again in vesicles and return to the Golgi apparatus (5). Acid hydrolases remain in the endosomes and eventually will be part of the lysosomes. The more likely destination of molecules inside multivesicular bodies/late endosomes is to be degraded in lysosomes. Although not mutually exclusive, two ways have being proposed: maturation of late endosomes by decreasing the internal pH and becoming lysosomes, or by fusion of late endosomes with previously existing lysosomes. In some cell types, endosomes are involved in another vesicular pathway known as transcytosis. When ligand-receptor complexes arrive at early endosomes by endocytosis, ligands are not released but the complexes are included again in another vesicle and targeted to other plasma membrane domain, different from that where endocytosis happened, and there it releases its content. This vesicular pathway happens in polarized cells, such as epithelial cells. In this way, molecules are endocyted in one part of the cell, the free apical surface, and released at another part, the latero-basal domain, or the other way around. By this mechanism, iron is transferred from food through the intestine epithelium. Some cell types (hematopoietic cells, dendritic cells, intestine epithelial cells, mastocytes and tumor cells) show some peculiarities in their vesicular trafficking. Besides becoming lysosomes, multivesicular bodies are able to fuse with the plasma membrane and release their inner vesicles to the extracellular space (Figure 5). These released vesicles are known as exosomes. They contain a distinct molecular composition compared with other cell compartments. For example, cholesterol and sphingomyelin are abundant in their membranes. Exosomes have been proposed as message carriers between cells. Figure 5. Release of the internal vesicles of multivesicular bodies after fusion with the plasma membrane. These vesicles, once in the extracellular space, are known as exosomes. Eukaryote cells are able to digest their own content by a mechanism known as autophagy. There are different types of autophagy. Macroautophagy consists in enclosing cytosolic material with organelle membranes. It results in a large compartment known as autophagosome that fuses with lysosomes. This last behavior, fusion with lysosomes, is similarly performed by multivesicular bodies/late endosomes. Macroautophagy is a basal constitutive mechanism in many animal cells, and it can be started or boosted by cellular stress like food deprivation, growth factors decrease, and high temperature. Many types of bacteria hack the endocytic pathway, mostly through phagocytosis, to enter the cell. The acid internal environment of endosomes is favorable for bacteria to first proliferate and then cross the endosomal membrane. Even some bacteria species have inhibitory molecules to prevent the fusion of endosomes with lysosomes, and escape from be degraded. Many types of virus also use endosomes to infect cells. Cabrera M, Ungermann C. 2010. Guiding endosomal maturation. Cell. 141:404-406. Neefjes J, Jongsma MML, Berlin I. 2017. Stop or go? Endosome positioning in the establishment of compartment architecture, dynamics, and function. Trends in cell biology. 27:580-594. Rind HB, Butowt R, von Bartheld CS. 2005. Synaptic targeting of retrogradely transported trophic factors in motoneurons: comparison of glial cell line-derived neurotrophic factor, brain-derived neurotrophic factor, and cardiotrophin-1 with tetanus toxin. Journal of Neurosciences. 25, 539-549.